After the Trump administration announced it was ending the Deferred Action for Childhood Arrivals program, Daniella Vieira was so afraid she emailed the CEO of Johnson & Johnson and asked him to take a stand. "I felt he needed to know that President Trump's decision would impact a J&J employee," said 23-year-old Vieira. "Maybe he didn't know the company has a DACA employee." Vieira came to the U.S. from Brazil when she was 11 and had been living in the shadows until 2012. That's when she enrolled in President Obama's DACA program, which has enabled nearly 689,000 Dreamers who were brought to the U.S. as children to openly attend school, get work permits and driver's licenses and gain protection from deportation. But now Vieira doesn't know if she'll be able to remain in the country. "This is crazy. I can't believe that this is my life right now," she said. 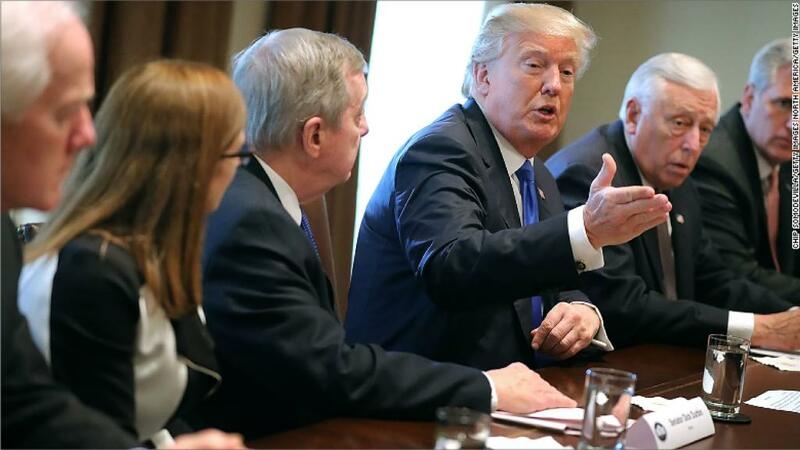 The Trump administration has left it to Congress to pass alternative legislation before the DACA program expires on March 5. But all eyes are on a Friday deadline to extend funding for the government and avert a shutdown. Democrats have made the funding negotiations contingent on reaching a deal on DACA. However, bipartisan negotiations for an immigration deal faltered this week, leading Republicans to push for a temporary funding fix instead. 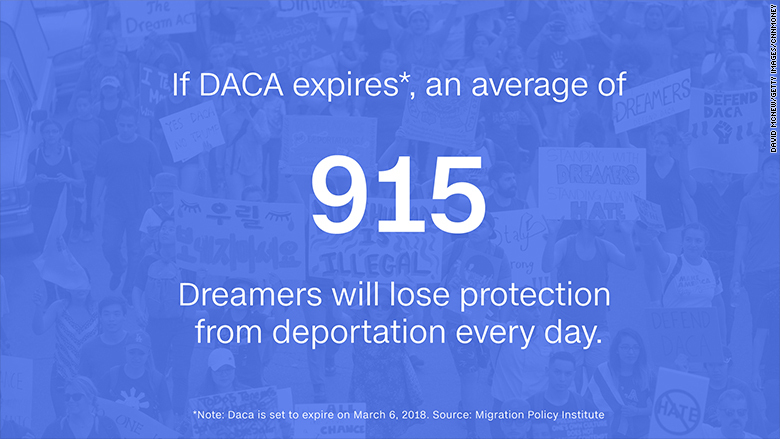 If Congress fails to act, an average of 915 DACA holders will lose their ability to work and their protection from deportation every day from March 6 to March 20, 2020, according to estimates from the Migration Policy Institute. Vieira's own status is set to expire later this year. Vieira graduated from Ohio State University last May with a finance degree. She had kept quiet about her status when she applied for her job as a financial analyst at Johnson &Johnson (JNJ), but the president's decision prompted her to out herself to her manager and to email the company's CEO Alex Gorsky to convey the urgency of her situation. "He responded very kindly," said Vieira, who works at the company's headquarters in New Brunswick, New Jersey. Vieira said Gorsky wrote in his email that Johnson & Johnson was committed to protecting the health and well-being of its employees. The company has since offered her help through its human resources department, including the possibility of extra time off, counseling and legal support. 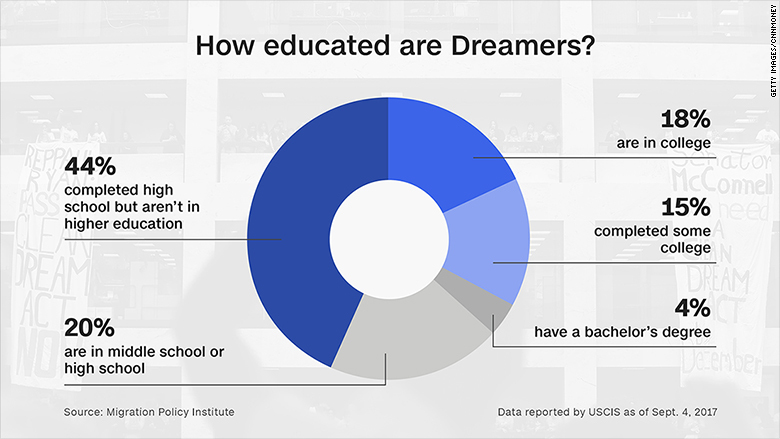 Gorsky later announced in a blog post that Johnson & Johnson had joined the Coalition for the American Dream, a group of more than 60 companies, including IBM (IBM), Facebook (FB) and Amazon (AMZN), that is seeking protections for Dreamers and pushing for a bipartisan solution on DACA. "We must continue to advance our culture of belonging, where open hearts and minds combine to unleash the potential of the brilliant mix of people, in every corner of the world," he wrote. 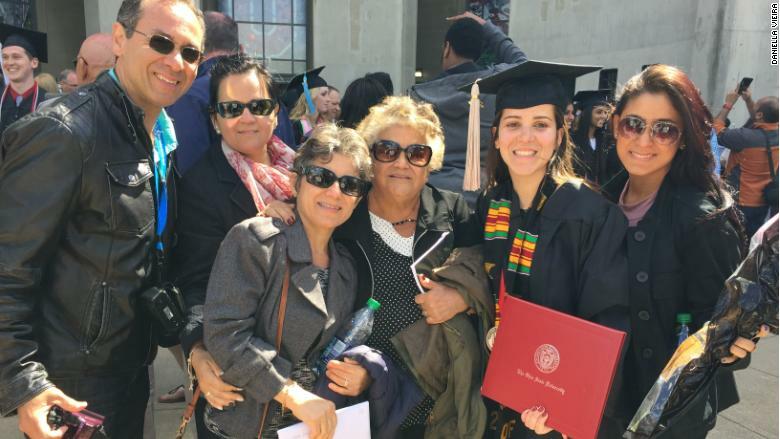 Danielle Vieira at her college graduation with her parents, cousin and grandmother. Corporate America implored Congress to find a fix for DACA. Earlier this month, the Coalition for the American Dream sent a letter to Congress urging lawmakers to pass legislation to protect Dreamers. The letter was signed by more than 100 prominent CEOs. "In addition to causing a tremendous upheaval in the lives of DACA employees, failure to act in time will lead to businesses losing valuable talent, cause disruptions in the workforce, and will result in significant costs," the letter said. "Every day that Congress doesn't act, more DACA recipients are losing their status," wrote Facebook CEO Mark Zuckerberg in a separate post Wednesday. "From my conversations with leaders in Congress, I believe they want to fix this, but we need to keep the pressure on so they know we'll hold them accountable," he wrote. Facebook declined to disclose how many Dreamers it employs. At least 30 employees with DACA status work at tech giant IBM, according to Chris Padilla, IBM's vice president for government and regulatory affairs. "They were hired on their skill, merit and personality," said Padilla. "They do software development for Watson, our AI platform, and they manage our cloud services for clients." When Hurricane Harvey knocked out power throughout Houston last August, Padilla said one DACA status employee worked remotely for 24 hours straight from his mother's house to keep the company's Cloud services running. "These are the kind of people we want at IBM," said Padilla. "They're exceptionally dedicated. It's why IBM has stood up to help them and standing up for what's right." IBM has sent some of its Dreamer employees to Washington, D.C., to share their personal stories with members of Congress, said Padilla. One DACA status employee, who asked not to be named, joined IBM's sales team in 2016 after getting a bachelor's degree in business. She said she is the first person in her family to go to college. "I want to stay with IBM, but my life is on pause right now," she said. "If there's no resolution for us, I don't know what I'll do. I'm scared." The employee said IBM's human resources department has offered legal assistance to DACA status employees, as well as other helpful information. 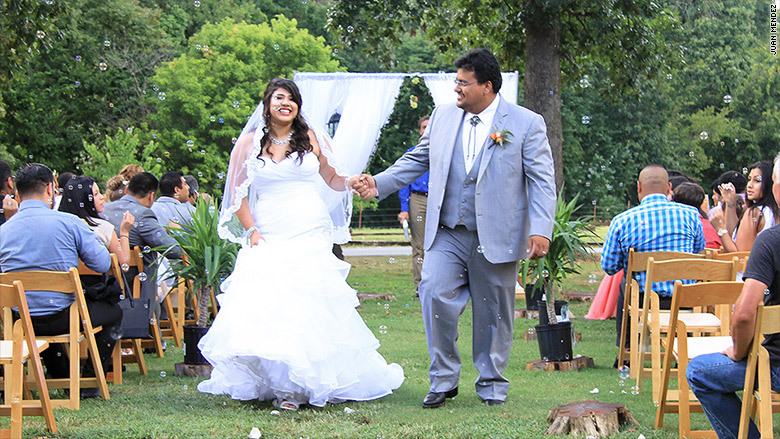 Juan Mendez with his wife Rocio Aguayo, who both came to the U.S. from Mexico as children. Both have DACA status. Juan Mendez is in a similar limbo. Mendez, 28, is a health and wellness specialist at Walmart (WMT) and his DACA status expires early next year. "If I lose my status, I wont be able to drive," he said. "I can't pay for my car, my income tax, my Social Security." Mendez was brought to the United States from Mexico when he was seven. He's been working at Walmart for four years now. "I brought up my status when I was interviewed for the job. I've never been shy about it," he said. Dreamers have a fire in the belly, he said. "We've gone through culture shock, language barriers, constant fear of being deported to work for some of America's biggest companies," said Mendez. "It's why they hire us." Walmart said it encourages "Congress to work on a bipartisan solution that provides clarity to those involved and recognizes those who have strong ties to their communities and came to the U.S. in a way that was outside their control." "As a company we have come to highly value many of these individuals as our customers and fellow associates. Any legislative solution needs to avoid disrupting families, our communities and the economy," it said in a statement to CNNMoney.